Immigration is a hotbed radicalizing issue in Europe and the US. Texas is ground zero here. Italy is ground zero there. A Record 4.8 Million Texans Voted Early in this years midterm elections. It's hard to say who that favors, but turnout was heaviest in Collin County where nearly 50% of registered voters have already cast their ballots. Collin county is heavily Republican. Politico asks Did Beto Blow It? Over the past six months, I spoke with a host of Texas Republicans about the U.S. Senate race. Many of them dislike Cruz. Some of them privately hope he loses. And all of them are baffled by the disconnect between the superior branding of O’Rourke’s candidacy and what they see as the tactical malpractice of his campaign. In their view, Cruz is uniquely vulnerable, having alienated Texans of all ideological stripes with his first-term antics—and especially those affluent, college-educated suburbanites repelled by Trump. Instead of pivoting to the center, as spring gave way to summer, the Democratic nominee hardened his positions. Where he had once hedged on his endorsement of "Medicare for all," O’Rourke began forcefully championing a single-payer system. Where he once avoided impeachment talk, O’Rourke reiterated, on the day he and Hurd received an award for civility in politics, that Trump should be removed from office. Where he once carefully straddled the border-security debate, O’Rourke said he was open to abolishing ICE if its duties could be assumed elsewhere. Invest in job training and apprenticeship programs. Impeach Trump —a position rejected by Nancy Pelosi, and nearly every other prominent Democrat in America, as futile and counterproductive. Open to abolishing Immigration and Customs Enforcement. It's easy to not like Cruz, but it's a lot easier to like Cruz when the opponent is extreme-left. I suspect this one will be close but Cruz will win. 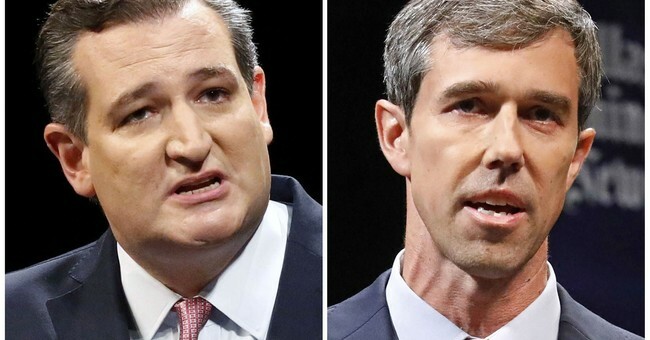 O'Rourke may be the only person Cruz can beat just as Hillary was the only person Trump could beat. Like Hillary, O'Rourke ran a poor campaign. Despite raising huge amounts of money, Cruz outspent O'Rourke on ads in the past few weeks. Yet, I would not be hugely surprised if O'Rourke won. It's not impossible. Neither Cruz nor O'Rourke reached out to the middle. Apparently no one wants it. Fiscal responsibility? No one wants that either. Deficits are out of sight and expanding rapidly. For eight years Republicans were against Obama's budgets. Trump's projected budgets are worse. A genuine middle-class tax cut would have gone over big. Instead, the middle class got peanuts. Military waste is enormous. Entitlements are out of control. Interest on the national debt is soaring. So how does Medicare for all, more Medicaid, more military spending and absurd makeshift job training programs, fit in? It's easy to be angry. Expect things to get worse when the next recession hits and public union pension plans go bust. Democrats easily win the House. Close but no cigar for Democrats winning the Senate. I give the Democrats 6 or 7 of those tossups. I suspect the Democrats lose Missouri and win all the rest. Even if they win all 7 they have to flip another seat. The best chance is Texas. So look for a 50-50 Senate tie or the status quo at 51-49. If the Democrats win the House, very little legislation will pass in the next two years, except of course more wasteful spending by both sides when the next recession hits. Meanwhile, the splintering is even more pronounced in Europe. Anti-EU Marine Le Pen is ahead of French president Macron in European Parliament polls. There is still no agreed upon Brexit solution, but I have one: No Brexit Deal, No Problem. This is not a good economic or political setup to say the least, both globally and in the US. Trumps tariffs make matters much worse.